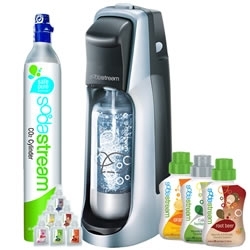 I'm sure by now most of my readers have heard of Sodastream...no you say?? Well recently I was given the amazing opportunity to review this great product so let me tell you a little about it! If your family is like my family you LOVE to have a nice cold glass of soda. With the price of soda rising more and more I am paying what seems like a fortune for our soda habit. Unless I happen upon a sale, which we all know is rare these days, I pay $4 for a 12 pack of soda which means about 33 cents a can. With the Sodastream I am only paying 25 cents a can. I know it seems that 8 cents a can is not a lot of money but think of it this way, my husband drinks 1 can of soda minimum a day and there are 365 days in a year. So at a minimum I will be saving $29.20 a year! Now that Sodastream has release a new energy drink that is just like Red Bull that amount has sky-rocketed even more! Where could you ever find an energy drink for only 25 cents a can?? ?Well you couldn't, even buying from a bulk foods or warehouse store you will still pay roughly $1 a can. Let's face it in this day and age money isn't the most important factor(although the favorite of most) there is also nutrition! Now I could go on and on about every product but here are some charts to make it easier. If you are having a hard time viewing the chart or would like to see more flavors you can find complete nutritional information HERE. Now to get a little more serious, we all know about global warming and the amount of waste we as humans produce. THIS is my favorite part of my new soda stream. My family and I have already saved over 100 bottles or cans from entering the landfill in just a few short weeks. Over my life time I will be able to say that as a family we have saved thousands! Lets face it we all say recycle, recycle, recycle and while my family tries to do our best even with recycling there is waste still. We are greatly reducing our carbon footprint, while making a healthier choice for my family! Are you ready to do the same?? You can purchase a Sodastream online HERE with free shipping on orders over $100 or you can find the store nearest you HERE if you can't wait! I received the Fountain Jet-Soda Starter Kit and have really loved it! I also received several additional flavors for my family to try. Keeping a gallon of water chilled in my fridges insures that I have a nice cold glass of soda whenever the urge hits. In under 2 minutes I am ready to go I can't wait to try more! I saw a commercial for this and really want to try it! It's a neat idea! I love the soda stream! I think this is one of the best gadgets yet! My husband tried the diet sodas and said they do not taste that bad at all. Kudos to soda stream! Great review! I have a Soda Stream and love it. I think it is an awesome product. Weird. I was just asking Melanie's input on this thing the other day because.Rich and I have been looking.into.them also. I would love to have one! I have heard so much about these, and would love to try one out! Great review, thanks for all the great detail! Looks delicious! A great alternative to traditional soda! Nice review. I prefer the fruit juices over the sodas but my kids love the soda. Happy to think of all the money I'm saving. I have never tried this product but it sound fun and I'm sure the grand kids would love this. Great review thank you for sharing! I love how bubbly the soda is. And that you can make it more fizzy. You can come over and we will have a sample party.lol Just warn me I like to have my water per-chilled in the fridge! I'm a little kid inside ;o) I mixed my water flavors in with my cola.